Just How "Vegetarian Friendly" are Colleges? Living away on a college campus while being a vegetarian is a lot harder than people think it is (I can’t even imagine what it’s like for vegans). Campuses love to say that they’re “vegetarian/vegan friendly” just to get as many new students as they can without “discriminating” against any potential newcomers. But just how “friendly” are colleges to students with restrictive diets? In most cases, hardly at all. 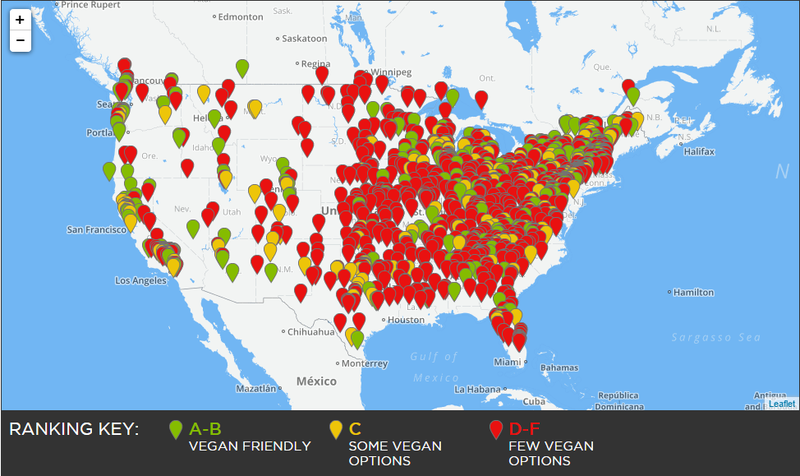 The map below shows students’ opinions of how “vegan friendly” they think their college is—majority of it is plain red, meaning there are few vegan options available. I graduated from Stockton University in south Jersey (formerly known as The Richard Stockton College of New Jersey) not too long ago. We may have recently transformed into a more prestigious university, but apparently that still doesn’t mean broadening our horizons and offering more diverse food options. Whether you’re a vegetarian/vegan who’s looking into going to college for the first time, transferring somewhere else, or simply just curious to see what other fellow vegetarian/vegans think of their food options on your campus, Peta2 has got you covered. Peta2 has a great page dedicated to college campuses that allows anyone to view their college and rate it on how “vegan friendly” it is. They call it a “vegan report card.“ I was curious the other day, so I decided to look up Stockton’s rating. Stockton somehow received a C after only making the first 2 out of 10 requirements and having a 0% student satisfaction rate. Now, I know these categories only apply to strictly vegans and not vegetarians, so I’m going to take these categories and apply them to strictly vegetarians and give Stockton the grade it really deserves. At breakfast, you can get an easy bagel or donut from Dunkin or grab a quick Poptart from Lakeside, but other than that (unless you eat eggs), the options are pretty limited. For lunch, the options open up a little bit. there’s pizza and pasta from Primo’s, fries from Chik-fil-A or Johnny Rocket’s, or soup and salad from Au Bon Pain. Then, there’s the dreaded N-Wing that has pretty much of all of these things in one convenient location (but some say that quality of taste beats out convenience in this case). For dinner, the options are pretty much the same, except Papa John’s opens and serves make-your-own burritos (kind of like Chipotle) and more pizza and fries. As for dessert, you can really go anywhere for a little ice cream, cookies, or other sweet treats. Although there are a decent amount of options, I’m still giving Stockton a B because of the same options throughout all locations instead of more diverse ones. I give this category a D because I personally have never noticed anything being labeled as “vegetarian.” However, the salads from Au Bon Pain do list all of the ingredients made in each salad directly on the front of the packaging, so that’s the only reason why Stockton’s not getting an F here. Although this doesn’t really apply to vegetarians specifically, I’m lactose intolerant! So I took this personally. I always have to make special trips to Shoprite 10-15 minutes off campus whenever I run out of milk because Lakeside doesn’t doesn’t carry Lactaid or other lactose-free milk. And I know I can’t be the only lactose intolerant student in all of Stockton. Ugh! Again, this is something I’ve never seen done before at Stockton. It’s easier for vegetarians to judge what’s “vegetarian friendly” rather than “vegan friendly,” but it’s still never safe to assume. and say “yes” or “no” even when they have absolutely no idea. This is also something that I’m just simply unaware of. There very well may actually be a vegetarian member on our student board, but without them being outspoken about it, how will I ever know?! Also, I’m just assuming that if there was one, there would be a lot more vegetarian/vegan options here because there’s someone higher up who would possibly fix the little diversity, especially if it was personal to them. Big. Fat. F. When I first transferred here, I honestly no idea where to go to eat. I had no choice other than to explore campus and read each dining locations’ menu or see what they were offering that day (which also tends to change day-to-day in some places). It was a frustrating process and I’m still frustrated to the day that Stockton has yet to promote which locations offer vegetarian options. I’ve yet to answer any survey that Stockton sends out just about every day about my restrictive diet (or simply whether or not I even have one). If Stockton realized how many other students like me there actually are, maybe I’d help to make life easier to all the other students who will be living on campus much longer than I am. But I’m not even given the option to! This one is pretty simple. Stockton just doesn’t “celebrate” Meatless Mondays with their dining locations. For those of you who don’t know, “Meatless Mondays”are supposed to promote a plant-based diet for a healthy lifestyle as well as protecting the earth. There is nothing advertised for “Meatless Mondays”—No posters, no flyers, no emails, no nothing. Although I would love this, I have to admit, it’s pretty unrealistic. There probably are a lot of vegetarian students at Stockton, but not nearly enough to dedicate an entire vegetarian dining location to it. I would like to be more lenient with the scoring on this since I understand why we don’t have an all-vegetarian dining facility, I can’t because…well…we don’t.